The Tax Man Cometh. Are You Prepared? 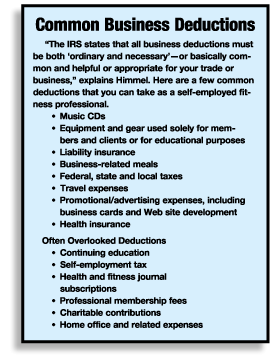 Sniewski, also a certified personal trainer, adds that being organized and knowledgeable about tax deductions can mean the difference between a tax bill and a tax refund—or in some cases, a tax penalty. Dave* learned this lesson when business—and subsequent income—at his karate studio increased exponentially in one year. When Dave first opened his studio, he tossed all his receipts into one big envelope, then sifted through and divided them out at the end of the year. He still uses a big envelope, but he goes through all his receipts at the end of each month and prepares a spreadsheet for that month. This makes tax time much easier. What did I have to hunt for? What categories do I need to add or subtract for next year? How much time did I spend filing my taxes this year? What is my goal for next year? 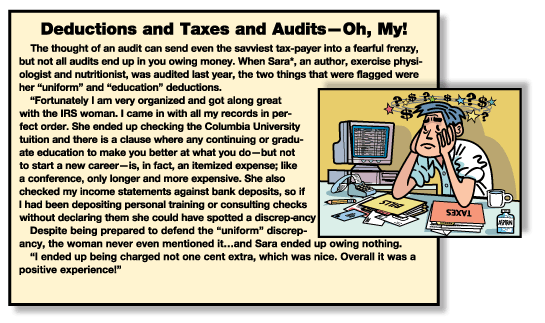 How can I organize my taxes even more? 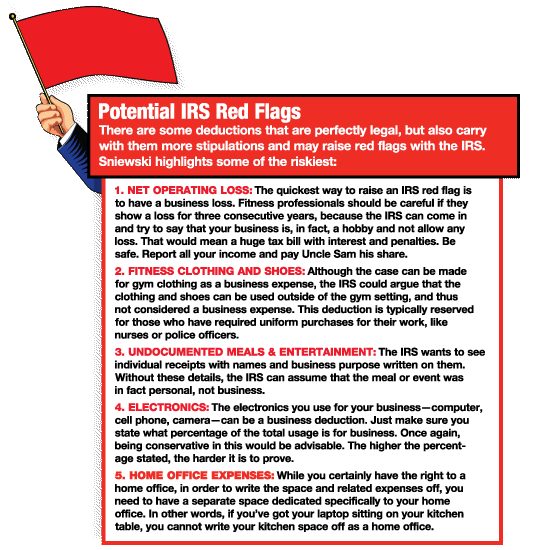 One error our experts agreed on that many business owners make is not claiming all they can on their taxes. “You might be surprised how much of your everyday expenditures can be deductible as legitimate business expenses,” explains Liberatore. But what about those of you who aren’t self-employed and work for someone else? Can you take any deductions? If you’re currently employed by someone else, and are itching to receive all these tax benefits—as well as the pride that goes with owning your own business—discuss with your current company’s management about hiring you as an independent contractor. 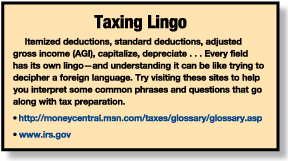 Regardless of whether you stay on as an employee or break off on your own—or have already done so—educate yourself as much as possible regarding taxes and the coinciding laws. After all, it is your hard-earned money; and while you should pay your fair share along with the rest of the nation, you should also take advantage of the laws that are set up to benefit your business and move you forward in your work. CARRIE MYERS has a B.S. in exercise science and has been a freelance writer for more than 11 years. She’s the author of the award-winning book, Squeezing Your Size 14 Self into a Size 6 World: A Real Woman’s Guide to Food, Fitness, and Self-Acceptance, and presents, teaches and trains in New Hampshire and Vermont. Want to Improve Your Performance? Breathe! Will WIC Inspire a Healthier U.S.? ACE is regularly featured in the media reaching more than 450 million people each year. From the Wall Street Journal’s article on electronic muscle stimulation, to Oprah.com covering 4 simple moves using balance pods to build core strength, read the latest from ACE in the news. ACE made its debut at the Asia Fitness Convention 2009 in Bangkok, Thailand, this past November. ACE representatives presented cutting-edge personal training and group fitness topics, including an introduction of ACE’s new ACE IFT Model. Read what AsiaFit conference attendees had to say! From hands-on live workshops held in cities nationwide, to online webinars you can take in the comfort of your own home, discover many convenient and exciting ways to earn CECs.